Wood: the amount of wood will depend on the size of your pegboard. Measure your pegboard and see how to much wood you will need in the tutorial. Spray paint is best for covering your pegboard so that it doesn’t fill up the holes you need for your pegs. Start by measuring your piece of pegboard. I had a scrap piece that my mom gave me so I needed to make my pegboard that size. 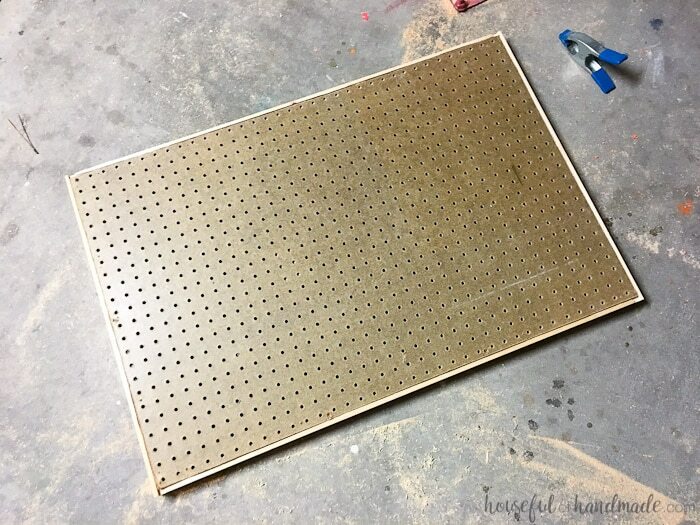 You will need to create a frame for your pegboard to sit into. 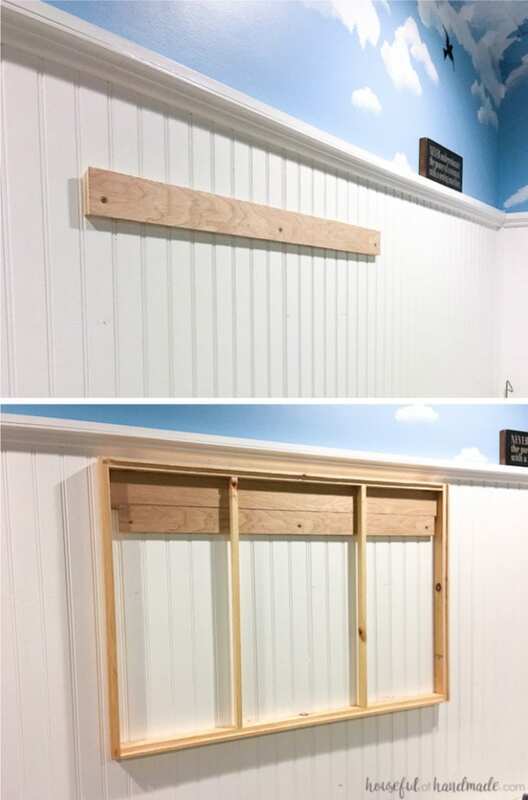 Since the outside of the pegboard is not pretty, we will notch out the frame so it sits inside the frame, then cover up the ugly edge with a second, thin frame. 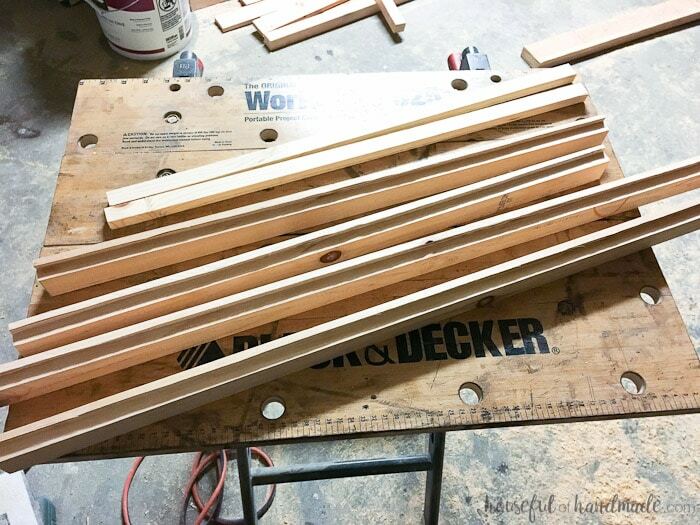 Cut 2 1×2 boards the width of your pegboard minus 1″ and cut 2 1×2 boards the height of your pegboard plus 1/2″. Now create a notch on one of the short sides of each of the 1×2 boards that is 1/4″ deep and 1/2″ wide (see picture below). This will create the notch for your pegboard to sit into so we can later cover up the ugly edges. I made my notches on my table saw. 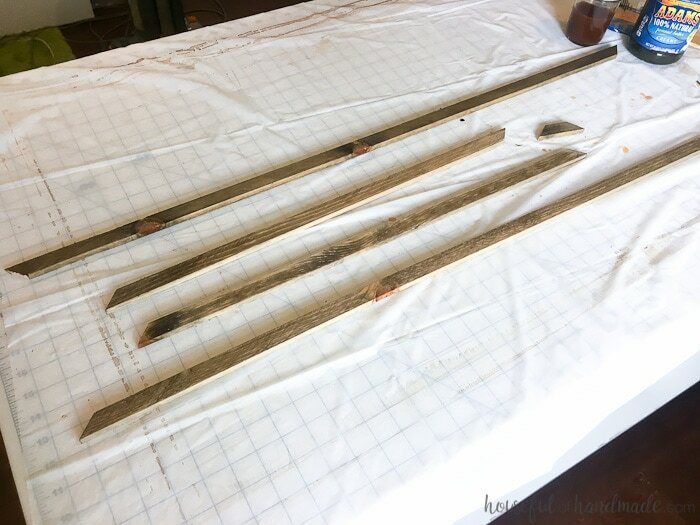 Set the blade height to 1/4″ and place your fence at 1/4″. Run the boards through. Then move your fence a blade widths further away from the blade and run your boards through again. Repeat until you have completely notched out the boards. Now assemble your frame. Add wood glue to the edges of the top board. Attach it to the side board so it is flush at the top. Clamp and secure with finishing nails or a screw (I prefer my battery powered nail gun for this because it leaves just little holes and is so quick and easy to use). Repeat on the other side. Then repeat for the bottom board (on both sides) so you have a completed frame. Double check that your piece of pegboard fits inside the notched frame. Trim your pegboard if necessary. Now add some supports to the frame. You want the frame to hold up to some weight and some use. 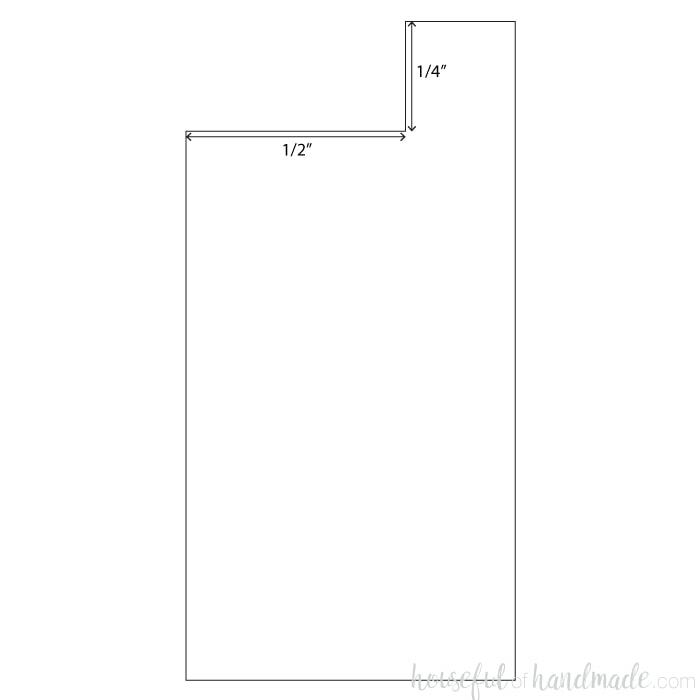 Cut 2 1×1 boards to the height of the opening in your frame. 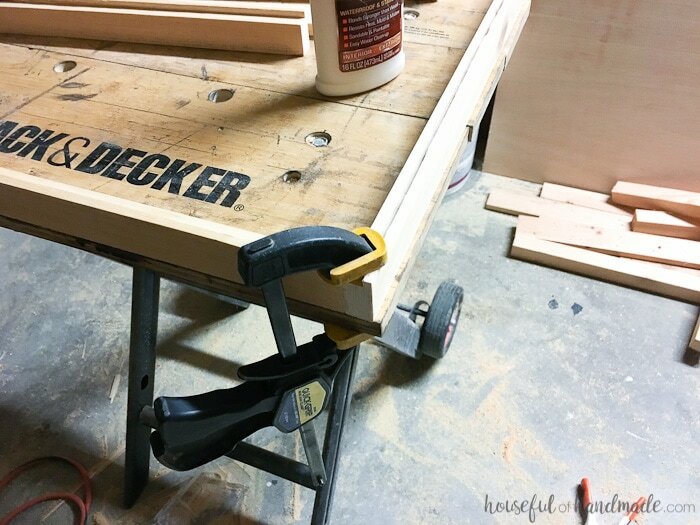 Using wood glue and your nail gun, attach them to the top and bottom of the frame. 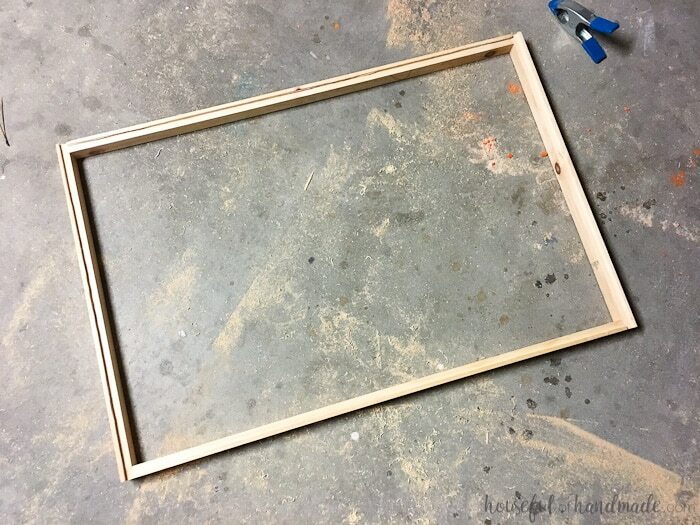 Make sure they are flush with the bottom of the notched frame so the pegboard sits on top of them when you put it in the frame. Finish your frame as desired. 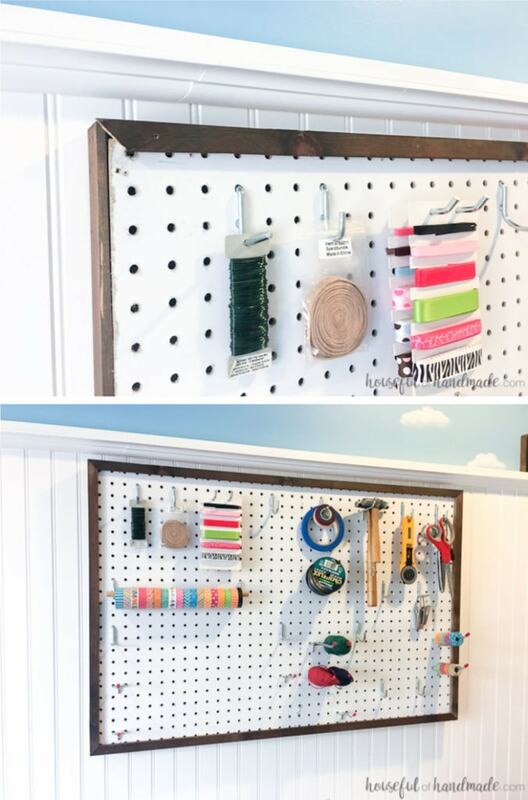 Now it’s time to create the perfect way to hang your pegboard so it is not permanent on your wall. I have a new found love for french cleats and it is the perfect solution for the pegboard. 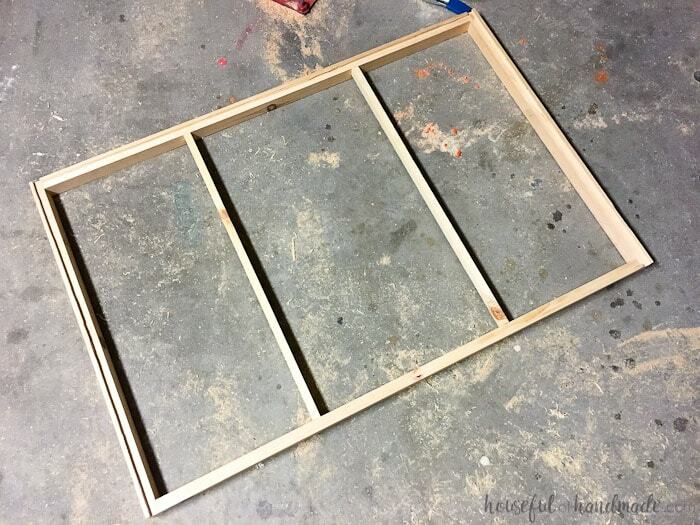 You may notice that your support boards are about 1/2″ in from the back of the frame, this will allow you to put a 1/2″ french cleat on the back and then it will be completely hidden by the frame of the pegboard. But you can easily lift if off the wall and move the piece of the cleat that is attached to the wall in just minutes. To make a french cleat, rip a piece of 1/2″ plywood to around 4-5 inches wide and the length of the opening width of your frame. Then rip the piece of plywood in half at a 45 degree angle down the length of the board. Now you have two pieces that interlock. Attach one of the pieces of your french cleat to the back top of your frame so it sits inside the frame. The french cleat needs to be attached so the angled part of the cleat is facing down and the longer part of the cleat is on the back of the frame (so you create a tooth that can grab onto the other cleat later). Use wood glue and your nail gun to secure it. Trim the other french cleat so it is about 1-2″ shorter than the one that is attached to the frame. This will make it easier to slide them together. Attach this cleat to the wall using a level. The angled part of this cleat needs to be facing upwards and the longer part of the angle needs to be away from the wall to create a tooth for the other cleat to fit into. Now it’s time to finish your pegboard and frame. I wanted the frame stained. I used a natural stain that included black tea and steel wool soaked in vinegar. Then to finish the pegboard, I recommend spray paint instead of rolled or brushed on paint. 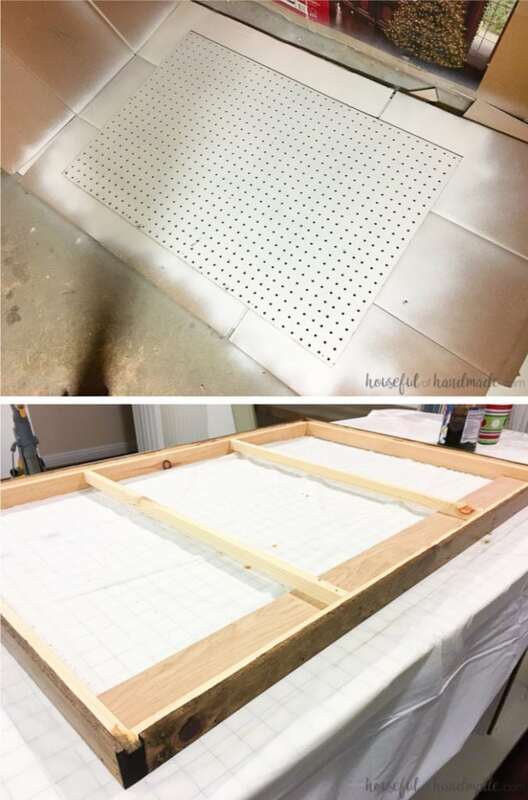 The spray paint is less likely to gum up your pegboard holes so you will be able to use them easier. 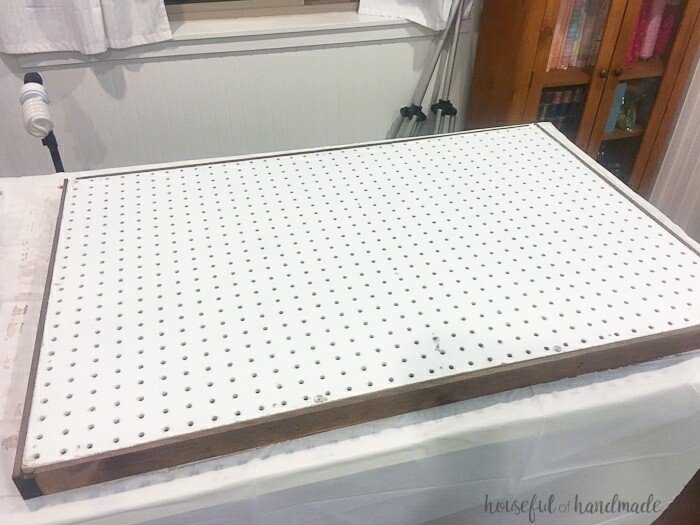 Once your paint is all dry, set your pegboard into the notched frame. Secure with nails around the entire edge and down the center supports. Now you can hang your pegboard and start using it, but remember I said we were going to cover up the less than pretty edges of the pegboard? 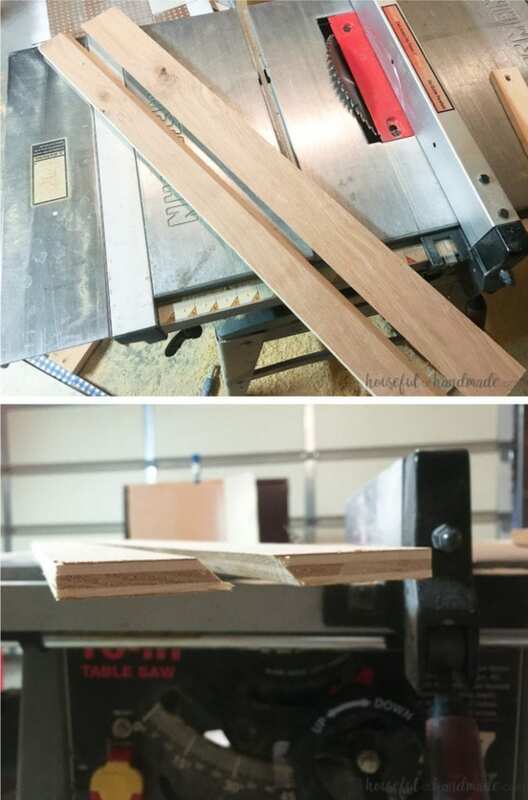 To do that you will want to cut pieces of 3/4″ wide stock, mitered at the corners, to fit around the edge of your frame. I wanted my frame to be super thin so that it didn’t interfere with adding the pegs to the board or using the entire area. To do this I ripped down 1×2 boards so I had 1/4″ x 3/4″ pieces of wood for my frame. Paint or stain the trim to match the frame. 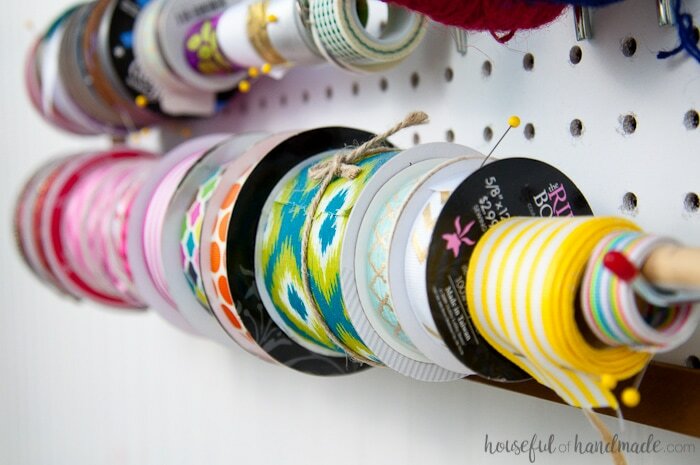 Use the pegboard hooks to organize everything. I love using dowels on the hooks to organize things like ribbons and tape. You will be able to easily see all your supplies so you can get to crafting! 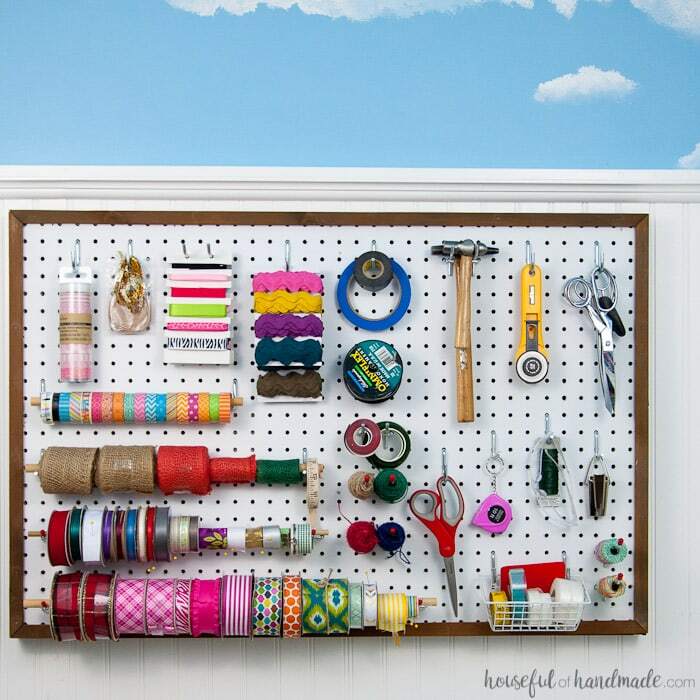 Now you have a beautiful pegboard that you can use to organize your whole life! Okay, maybe not your whole life but I feel so much more together by having my craft supplies organized and accessible. It’s the little things that make me really happy. And don’t forget to follow along as I finish this room for only $100!